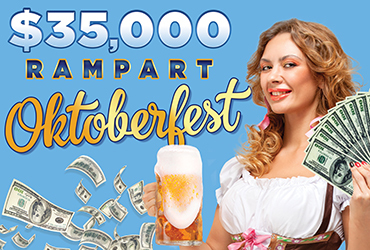 Rampart Rewards players earn entries into the $35,000 Oktoberfest Table Games Drawings beginning September 29 by playing Table Games. One hour with a $10 average bet on table games earns one entry in the drawings. 9 winners will have a chance to win up to $8,000 in cash and chips guaranteed to be given away each weekend as well as a chance to double their prize amount with a 2X prize multiplier added to each drawing’s prize pool.